LA JOLLA–This Mother’s Day, Truluck’s Seafood, Steak, and Crab House invites families to treat mom to a celebration of family and fine-dining, complete with mouthwatering, Southern-inspired cuisine, limited-time brunch offerings, stand-out libations, a special gift for mom, and more. 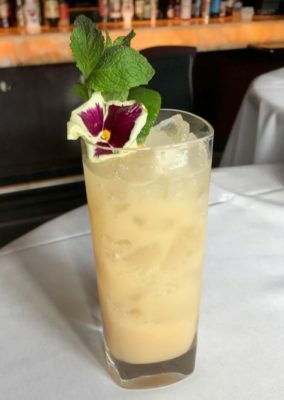 The restaurant’s mixologists have created an exclusive, mom-inspired specialty cocktail, “The Matriarch” for the occasion. The flowery concoction is made with an endearing mix of rum, Montenegro amarol, Shochu (sweet potato and rice vodka from Japan), orgeat and lime juice. Truluck’s mixologists hand craft libations with expert care, using only premium spirits mixed with fresh fruit and hand-squeezed citrus juices. Additionally, Truluck’s wine list, recognized by Wine Spectator Magazine’s Award of Excellence, offers perfect mealtime pairings with more than 70 exquisite varietals available by the glass and bottle. Mother’s Day hours for Truluck’s La Jolla are 11 a.m. to 8 p.m. The full dinner menu will be served throughout the day. Brunch offerings will be available until 3 p.m.
Advanced reservations are strongly encouraged. Call Truluck’s La Jolla at (858) 453-2583. Business casual attire is requested. Recipient of the Gold Medallion Award for Best Seafood Fine Dining, San Diego by the California Restaurant Association (CRA), Truluck’s La Jolla (8990 University Center Lane, La Jolla, California) is open daily from 5 to 10 p.m. on Monday through Saturday and 5 to 9 p.m. on Sunday, with Cocktail Hour daily from 4:30 to 7 p.m. in the Stone Crab Lounge.